I think it was Lisa who said that her pizzas always come out shaped like Texas. Lisa lives in Texas. I can honestly say that mine come out shaped like all different states but this time I actually think it was Washington. Coincidentally, I live in Washington. Anyway, non-circular shapes aside, this pizza was inspired by a magical one I had at Delancey. Last Friday I took nine out-of-town food bloggers to this hot spot in Ballard. People have strong opinions about the best pizza in Seattle but for me there is no discussion. At Delancey there were nine pizzas on the menu. Of course it made sense to order one of each pizza, right? We greedily dug into the first few and then they just kept coming and coming and coming and… We were reluctant to leave any slices on the table because it was all so good. My favorite part of a pizza is the crust and I want to really taste that crust. Brandon’s has tremendous flavor and the perfect char. It is thin and light but substantial enough to not be cracker-y. He does not drown the pizza in toppings nor is he heavy-handed with the cheese. He makes the perfect pie. A favorite on our table featured padrón peppers which you can find at our farmers markets this time of year. In fact, I had to fight someone for a slice of this pizza. I played the vegetarian card (whiny voice: “But half of these pizzas I can’t eat! I need a slice of all the veg ones!) As with all of the pizzas, this pie was a model of restraint. A bit of sauce, a bit of cheese, and a couple of thinly sliced peppers strewn over the top. I love heat and was lucky enough to find that my particular pepper was spicy (with padrón, some are spicy and most are not). On a table full of great food, that pizza really stood out. I have been meaning to grill more pizza this summer and now that the season is almost over, it’s time to get to it! Knowing that my crust would not taste as good as Brandon’s and knowing that I would never get it as delicate as his, I decided to add a bit to his idea. Gorgeous corn was for sale alongside the peppers at one of my favorite stalls so I picked up some of that. I was in the midst of a time crunch so I decided that dinner had to come 100% from the market and my refrigerator. I didn’t have any mozzarella on hand so I just used Parmesan. I grilled the corn and the peppers, used a disk of homemade dough I had defrosted from my freezer, and successfully grilled a Washington state shaped pizza. I had a small piece and Randy ate the entire rest of the pizza. Seriously. I thought I would have some left over for the babysitter tonight but apparently, if she wants to eat pizza, it’s going to be the Trader Joe’s special. Randy loved it and I did too. It’s not Delancey but it’s pretty good. One last thing. I should tell you that I don’t have a favorite pizza dough. For this one, I used Jim Lahey’s version which I don’t love and am currently auditioning others. Use the one you like best. If you are crunched for time and live in the Seattle (or Burien) area, Grand Central Bakery makes one that is really good and fairly priced. Preheat your grill to medium-high. Rub a bit of olive oil on the corn and peppers, then sprinkle with kosher salt. Carefully place on the grill and cook, turning occasionally, until the peppers and the corn are blackened in spots. You will want more color on the peppers than the corn and the peppers should be soft. This process takes about 15 minutes. Remove the vegetables and turn the heat on the grill up to high. Once the vegetables are cool enough to handle, split open the peppers (don’t peel them!) and remove the seeds and membranes. Thinly slice and set aside. Cut the corn off the cob and set aside. Dust a pizza peel with cornmeal or semolina flour. Using your hands coax the dough into a nice thin circle (or the shape of your home state). Working quickly and carefully, slide the dough on to the peel and then on to the grill. Close the lid. You want nice grill marks on the bottom but don’t allow it to overcook. Depending on the heat of your grill, this can happen very quickly. Using tongs, turn the dough over. 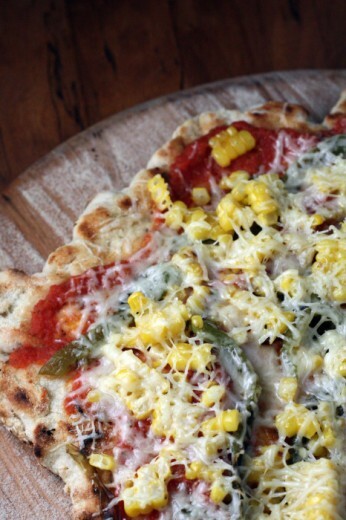 Spread the sauce all over the dough, scatter the peppers and corn over the surface and then sprinkle with the Parmesan. Close the lid of the grill and cook for about 10 minutes, or until the edges of the dough are brown and the cheese is melted. Remove and serve. Drain the tomatoes well. Put all the ingredients in a blender and purée until smooth. I totally want to find padron peppers here in Vancouver. If I can find them, I’ll totally riff on this one. I had that pizza at Delancey so I know of what awesomeness you speak of. Yum. I will have to make a return Delancey visit this fall I think! Then cue the burrata…the salads…the beer & wine…and suddenly I find myself having food sweats from eating too much pizza. I felt guilty just slices sit there. Dang girl. DANG. I know NY pizza has it’s claim to fame, but to be fair a lot of it is mediocre. Or maybe I’m just picky. These toppings sound fantastic. A little spice, a lot of flavor. My pizzas never come out shaped like much of anything. I should start looking more closely, though. Maybe I can start to tell the future by reading pizza doughs. My favorite dough right now is Mark Bittman’s! You should give it a try! 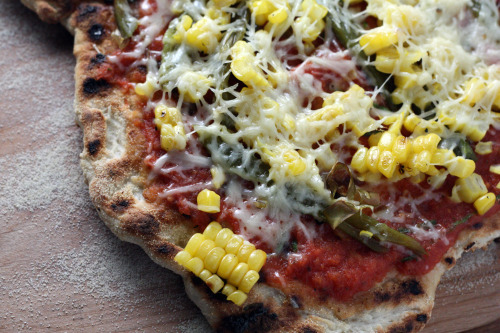 The corn looks terrific on a pizza. I have never had “Padron” peppers. Is Delancey Molly Wizenberg’s place? i love the corn on the pizza top! I have been meaning to grill pizza all summer. I’ve had a dough bookmarked and topping ideas in my head and yet it’s alluded me. Yours looks fabulous. 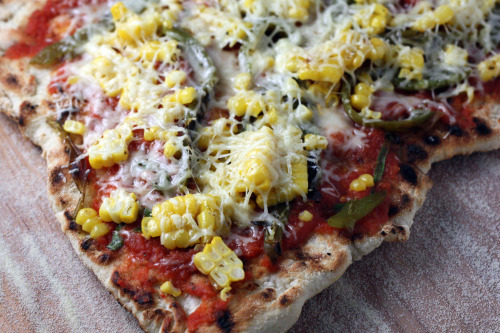 Corn on pizza – this is the time of year for it! This sounds like perfect simplicity. I am going to the Ballard farmer’s market today and will look for those peppers. If you ever hear of Brandon teaching a class on how to make dough, will you let me know?! He does make the best. Thanks for bringing a little bit of Delancey to us east-coasters! This looks delicious with the corn! I’m going to make your polenta with tomatoes & corn tonight. Can’t wait! Ha! My pie dough gets rolled into Texas shapes too. The toppings sound fantastic. I’ve finally been able to try padron peppers, and they’re the best!